The Agilis 400 Watt C Band BUC (Block-up Converter) is designed for the SCPC (Single Channel Per Carrier) network configurations and for low or Intermediate data rate for MCPC (Multi-Channel Per Carrier), DAMA (Demand Assigned Multiple Access) or TDMA (Time Division Multiple Access) applications. The design of the Agilis 400 Watt C Band BUC provides the highest level of output power linearity in its class ensuring optimum performance no matter the application. 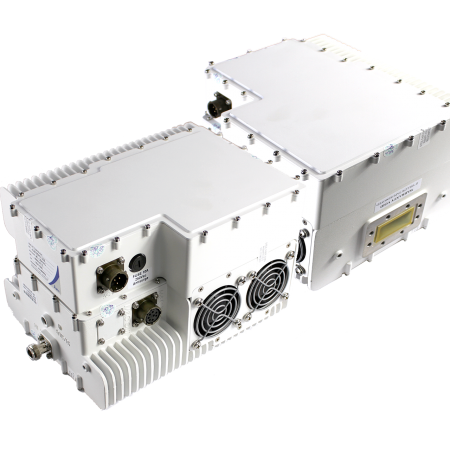 The Agilis 400 Watt C Band BUC (Block-up Converter) is designed for the SCPC (Single Channel Per Carrier) network configurations and for low or Intermediate data rate for MCPC (Multi-Channel Per Carrier), DAMA (Demand Assigned Multiple Access) or TDMA (Time Division Multiple Access) applications. The design of the Agilis 400 Watt C Band BUC provides the highest level of output power linearity in its class ensuring optimum performance no matter the application. The Agilis 400 Watt C Band BUC utilises a robust 96-264V AC power input that includes line filtering providing protection from localised power fluctuations that are often encountered in remote areas. The Agilis 400 Watt C Band BUC can operate in a wide range of environmental conditions ranging from -40°C up to +60°C.